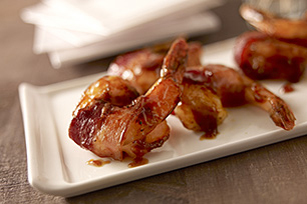 Bacon-wrapped shrimp? Sounds good. May we recommend adding mango nectar and a chipotle-BBQ marinade to bring a little sweet and spicy to the party? Mix nectar and 1/4 cup barbecue sauce until blended; pour over shrimp in shallow dish. Turn to evenly coat both sides of each shrimp. Refrigerate 30 min. to marinate, turning shrimp after 15 min. Heat broiler. Remove shrimp from marinade; discard marinade. Wrap bacon around shrimp; place on rack of broiler pan. Broil, 4 inches from heat, 8 min. or until shrimp turn pink, turning and brushing with remaining barbecue sauce after 4 min. Heat greased barbecue to medium-high heat. Marinate, then wrap shrimp with bacon as directed. Grill 6 to 8 min. or until bacon begins to brown around edges and shrimp turn pink, turning and brushing with remaining barbecue sauce after 4 min.